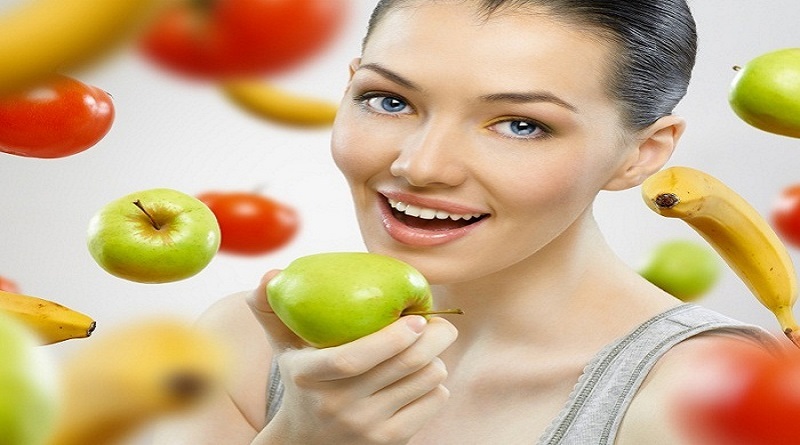 Home Food and Diet What is the Best and Worst Time to Eat Fruits? You may be very much aware of the benefits fruits have in store for the overall health and well-being. However, do you know that to harness the maximum benefits you need to follow some specific guidelines or should know what is the best and the worst time to eat fruits? Incorporating fruits in your diet in a proper manner can make your digestive system much more powerful through improved digestion and vitamin intake. If you check the nutritional value of fruits, then you will come to know that most of the fruits are loaded with fibre, vitamin C, folate, potassium, antioxidants and much more. All these nutrients offer protection against several health disorders which people encounter in their day-to-day life. Let’s check out some of the guidelines you must be aware of while eating fruits to get the maximum benefits. Eating fruits is a wonderful method to detoxify your body and maintain the required level of natural sugar and other nutrients in the body. But if you are adopting a Fruitarian Diet, make sure you don’t exceed it more than a week. It has been suggested that one should include 3 serving of fruits in their diet on a daily basis for detoxifying their system and helping the digestive system to function properly. 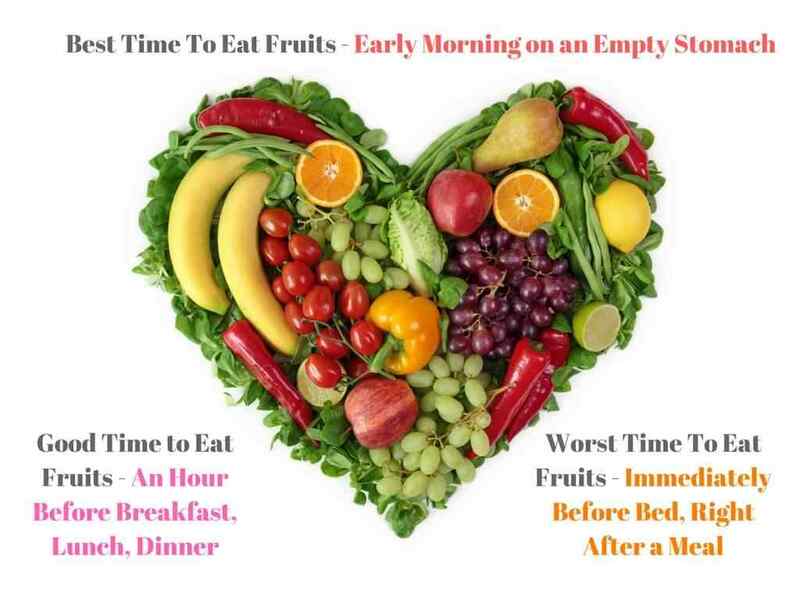 Now the question is, what is the best and worst time to eat fruits? The best time to eat fruits or include them in your daily diet is in the morning, on an empty stomach. You can also eat fruits in between your meals as this is the time when the process of digestion occurs quite faster and our body uses various enzymes for the digestion of fruits in an efficient manner. Fruits are a great source of simple sugars that require time to be entirely absorbed by our body. Hence, whenever we consume fruits on an empty stomach or in between meals, all fibres, simple sugars and nutrients easily get processed properly in our body. This process ensures that our body would derive maximum benefits or optimal nutrients from the fruits. One should avoid eating fruits immediately after having meals. The ideal gap one should maintain is of approx 30 minutes before or after a meal. However, the recommended time gap for eating fruits after a meal should be around two hours for someone suffering from digestive ailments such as acidity or diabetes. Best time to include fruits in your diet is either post or pre-workouts. One can consume the fruit of their choice immediately post their workout session. Here, the natural sugar in fruits offers immediate energy to your body required after or before a workout. Many researchers have proven this again and again that eating fruits in the evening or close to bedtime is not beneficial to the body. It leads a surge in your insulin and blood sugar levels that makes it difficult for our body to fall sleep. Hence, one should not eat fruits in the evening or at night after dinner. Don’t forget the other rule to have your dinner at least 2 hours before bedtime. If you are following a weight loss regime, then the very first thing that you should keep in mind is to say “no to fruits” after lunch. It will ensure that your body would experience calorific deficit and will start using stored fats as a source of energy. However, it is not essential to skip fruits when you achieve a level in weight loss, as there could be some other dietary factors that slow down weight loss. Before or after having your meal, offer a grace period of minimum 30 minutes for your body to consume fruits. Eat fruits on an empty stomach. This will make it easy for your body to absorb a complete dose of nutrients from the fruit diet. Try to include your favourite fruit in your diet mostly in the morning. It will give your body sufficient time to use the natural sugar. Avoid eating fruits with your meals. Including fruits in your dessert does not offer desired results to your body. Try to get organic fruits to avoid the ill effects of remaining pesticides. One should also avoid using canned, frozen or the processed fruits, as such fruits contain more sugar, added preservatives and sugary syrup. Once you are aware of the best time to eat fruits, you will surely get a hold on the secret to health, happiness, longevity and beauty. Breakfast – YES, apples contain Pectin which lowers blood sugar and cholesterol. Dinner – NO, Pectin is hard to digest at night and increases stomach acid. Lunch – YES, Strengthens immune system and improves skin. Dinner – NO, May lead to the mucous formation and disturb digestion. Snack – YES, Improves digestion and increases metabolism. Breakfast – NO, Eating on empty stomach may cause stomach irritation and gastritis. Mango is an energy food. It is best to eat mangoes 30 minutes before your workout session to make you feel energetic. Also, it keeps cholesterol in check. Breakfast – YES, Papaya is less acidic, so when taken in breakfast, it will act as a soother for your stomach. Also, it improve’s one’s complexion if taken early in the morning. Dinner – YES, Papaya is a light fruit and helps in digestion during night time but avoid consuming it immediately after your meal.